Comunale Construction Co., Inc. was founded in 1958 by Frank P. Comunale and became incorporated in 1960. 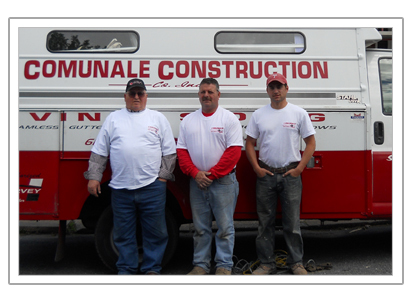 Comunale Construction Company is a family owned business operating in North Bangor at the same location for over 50 years. Frank P. Comunale originally started out serving the entire Slate Belt area and today the company has grown to service a radius of 30 miles. Frank P. Comunale’s son, Frank C. Comunale, worked for his father every summer since he was 13 years old. He joined the company full time in 1978. The two of them worked together on the job site every day, installing siding, windows, roofing and gutters. When Frank P. Comunale retired, his grandson, Frank C. Comunale, Jr. came on board starting a third generation business. Now Frank C. and Frank Jr. work closely together following in their fathers and grandfathers footsteps. You can still find Frank P. visiting the job sites, running for materials and expressing his expert opinions. They currently have customers who are second and third generations, which enables them to continue the family tradition.